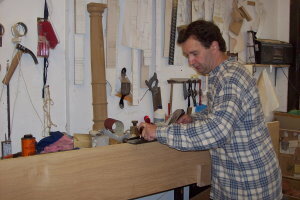 Simon started his career as an apprentice for one of the country's top cabinet maker firms, Arthur Brett and Son in Norfolk, they specialised in top quality mahogany and walnut reproduction furniture. Having passed his five year apprenticeship he went on to study furniture design and history being awarded the Licentiateship of the City and Guilds. 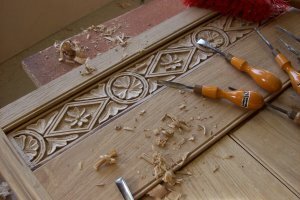 At the age of 22 Simon moved on to another Norfolk cabinet maker company which specialised in early English oak and fruitwood country furniture, working for them for over 15 years in classic early English furniture design. 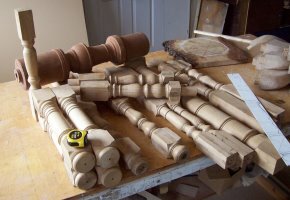 For the next fifteen years valuable experience was gained working in restoration of early oak furniture, fittings within church buildings and making copies of oak furniture in reclaimed and new timber to the highest standards. He also at this time taught as a lecturer in furniture making and design at City College Norwich using his vast experience and expertise in the cabinet maker trade. Simon's passion for cabinet making led him on to have his own business, working from his own workshop, supplying private customers and well established interior design shops with bespoke furniture, for which he is well respected. 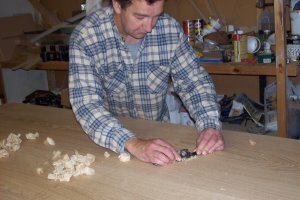 All of his forty years of cabinet making is put to the daily test of making beautiful furniture seen by many of his customers as heirlooms for future generations. As well as his own experience, Simon calls upon the skills of fellow crafts people he has known for many years. These include: Woodturner, Carver, French Polisher, Blacksmith, Foundry Worker for hand cast brass handles and fittings and Leather Polisher and gilder. So it is possible with the input of all of these craftsman, to create a single item combining over one hundred years of craftsmanship.